Civil War artillery was vital to the outcome of the conflict as well as the massive casualties that it inflicted on both Union and Confederate armies. For example, known as "Artillery Hell," the Battle of Antietam engaged a total of 500 Northern and Southern field artillery during a major artillery duel in September 1862, in what became the bloodiest single-day in American military history. Often overlooked were the Civil War artillery units. For example, according to Dyer (1908) and The Union Army (1908), the highest combat related casualties sustained by any New York unit during the four year conflict was the 8th New York Heavy Artillery: the Civil War artillery unit suffered 19 officers and 342 enlisted men (361 total) in killed and mortally wounded (100 more than the famed 69th N.Y. "Fighting Irish" Infantry); 4 officers and 298 enlisted men died of disease (302 total). Grand total 663 deaths. Additionally, the 8th N.Y. Heavy Artillery suffered 37 officers and 707 enlisted men in wounded (744 total). Killed 663; Wounded 744. Grand total casualties (killed and wounded) 1407. Statisticians applied various metrics for their tables and totals, and one such number that was not high on their list was the total of men that died of disease. Perhaps it was because the heroes were reported to have died on the battlefields, while death by disease just doesn't have the same heroic and romantic connotation. Dying as a prisoner-of-war was also intentionally left out of many of the grand totals, for if death by disease and death while incarcerated in Confederate prisons were counted, the 7th N.Y.H.A. would rank first for the Empire State, because it lost 677 in total deaths. See also Total Union and Confederate Casualties. While artillery units, both light and heavy, were generally stationary while in combat and therefore suffered high casualties (including captured), the artillerists were often overrun by advancing infantry and then found themselves engaged in fierce infantry counterattacks. Whereas seacoast guns were crucial to the defense of forts and ports, mortars would be used to rain down death on those who were believed to be otherwise untouchable. This is an introductory lesson for the artillery newbie and is a refresher lesson for the more seasoned artillerist. At the bottom of this page are several links that offer from casual to very specific information on Civil War artillery and cannon. During the American Civil War, the United States Army consisted of three principal components known as branches: infantry, cavalry, and artillery. The army classified its artillery into three types, depending on the gun's weight and intended use. 1) Field artillery were light pieces that often traveled with the armies. 2) Siege and garrison artillery were heavy pieces that could be used either in attacking or defending fortified places. 3) Seacoast artillery were the heaviest pieces and were intended to be used in permanent fortifications along the seaboard. They were primarily designed to fire on attacking warships. The distinctions are somewhat arbitrary, as field, siege and garrison, and seacoast artillery were all used in various attacks and defenses of fortifications. 1) Field artillery in the Civil War refers to the important artillery weapons used to support the infantry and cavalry forces in the field. 2) Siege artillery is heavy artillery primarily used in military attacks on fortified places. 3) Seacoast artillery were the heaviest pieces and were intended to be used in permanent fortifications along the seaboard. They were primarily designed to fire on attacking warships. Civil War field artillery refers to the important artillery weapons, equipment, and practices used by the "artillery branch" to support the infantry and cavalry forces in the field. It does not, however, include siege artillery, use of artillery in fixed fortifications, or coastal or naval artillery. Nor does it include smaller, specialized artillery termed as infantry guns or mountain guns. See also American Civil War Artillery Organization and Civil War Artillery Weapons and Characteristics. The principal guns widely used in the field are listed in the following table. 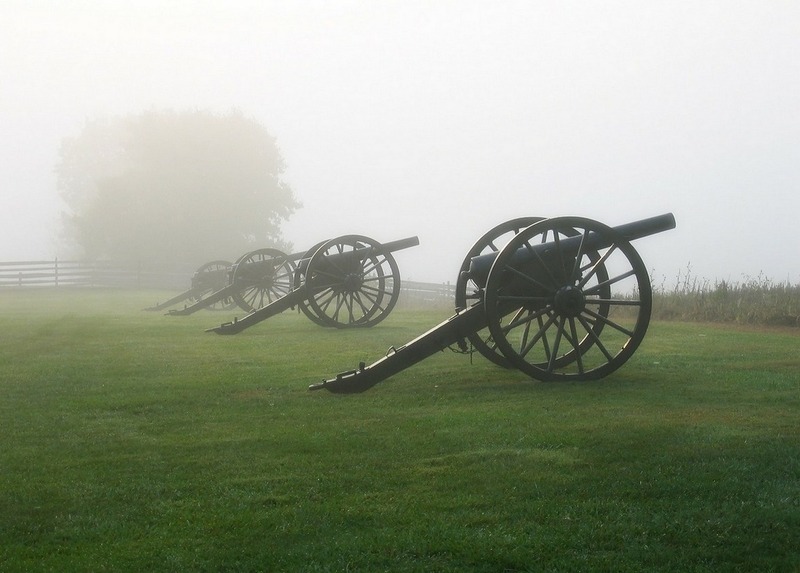 Artillery played a crucial role in determining the outcome of the Battle of Gettysburg. (See Battle of Gettysburg and the Infantry, Cavalry, and Artillery.) Artillery units fought desperately side by side with their infantry counterparts during all three days of the battle and Union guns made up the difference during the July 3rd finale known as Pickett's Charge. 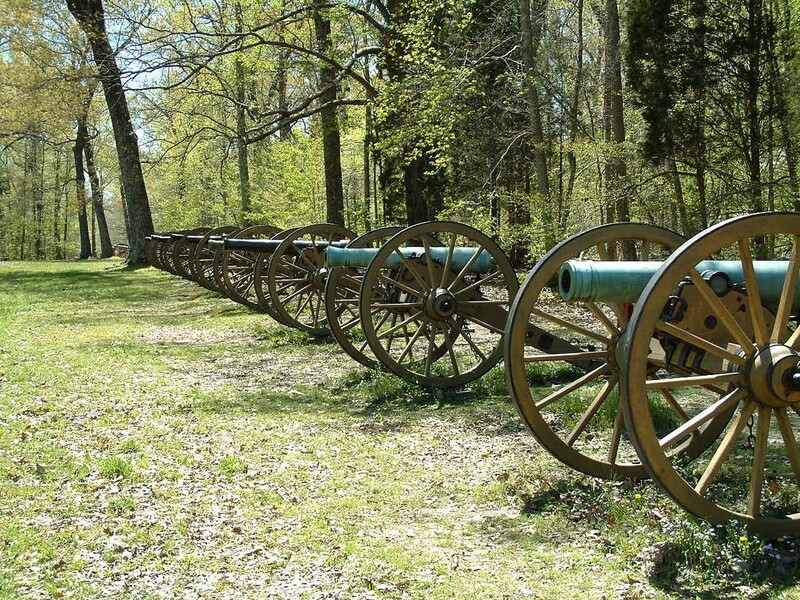 Today, there are hundreds of cannon that line park avenues at locations where Union and Confederate batteries were established during the battle. 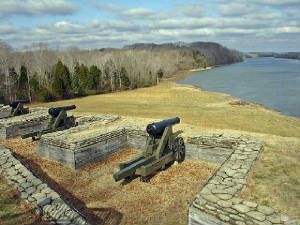 Each position is marked by a tablet or monument with a compliment of cannon of the type used by that organization during the battle. Visitors are quick to note that the guns on both sides are very similar in design and made of bronze or iron. In fact, Confederate artillery units were not only armed with Southern-made cannon, but a number of captured Union guns filled Southern artillery organizations. One popular story relates that a captured Confederate soldier was observed closely inspecting the guns of a nearby Union battery. The man would look at the "US" stamped on the top of each gun barrel then simply nod his head in acknowledgement. When a Union soldier asked the Southerner what he was looking at, the man replied, "Ya'll have as many of them thar US guns as we have!" Artillery in the 1800's fought side by side with infantry units because the range of the big guns limited them to visible targets. Like the infantry weapons, Civil War-era cannon were muzzle loaders and required a crew of eight men to aim, load, and fire the weapon. Maintaining the large guns was an important job and discipline in the artillery was very strict due to the value of the weapon. One artillery unit was referred to as a battery. Composed of six cannon and just over one hundred men, the battery was commanded by a captain. Many batteries were companies of an artillery regiment. Battery A, 4th US Artillery or Battery B, 1st New York Light Artillery are examples of this. Some Northern states raised "independent" batteries, which were not attached to an artillery regiment. New York supplied fifteen independent batteries including Captain Andrew Cowan's 1st New York Battery and Captain Patrick Hart's 15th New York Battery, both of which fought at Gettysburg. Confederate batteries were, for the most part, labeled by the nicknames of where they were raised or by the name of the battery commander. The "King William Artillery", commanded by Captain W.P. Carter, was typical of a Virginia organization. In the same battalion were the "Jeff Davis Artillery" from Alabama, and the "Morris Artillery" and "Orange Artillery" from Virginia. 12-pounder bronze gun, Model of 1857. Commonly referred to as the "Napoleon", this bronze smoothbore cannon fired a twelve-pound ball and was considered a light gun though each weighed an average of 1,200 pounds. This powerful cannon could fire explosive shell and solid shot up to a mile and charges of canister up to 300 yards with accuracy. The Napoleon was a favorite amongst some Northern artillerists because of its firepower and reliability. Two Union batteries armed with Napoleons at Gettysburg were very effective in holding back Confederate infantry attacks and knocking down opposing Southern batteries. Battery G, 4th US repeatedly slowed Confederate infantry attacks against the Eleventh Corps line on July 1 while Captain Hubert Dilger's Battery G, 1st Ohio Light Artillery almost annihilated two Confederate batteries with accurate and punishing counter-battery fire at long distance. Most Union Napoleons were manufactured in Massachusetts by the Ames Company and the Revere Copper Company. Confederate industry replicated the Napoleon design at several foundries in Tennessee, Louisiana, Mississippi, Virginia, Georgia and South Carolina. The Confederate design differed slightly from Union-made guns but fired the same twelve pound shot, shell and canister rounds used in Union manufactured guns. 2.9-inch (10-pounder) Parrott Rifle. This iron cannon was rifled and fired an elongated shell made specifically for the gun. Designed before the war by Captain Robert Parker Parrott, this gun was longer than a Napoleon, sleeker in design, and distinguishable by a thick band of iron wrapped around the breech. The Parrott design went through several improvements during the war and was changed in 1863 to a larger 3-inch bore and matching Parrott shell. The 3-inch Parrott was standardized the following year and most 2.9-inch guns were withdrawn from service. Parrott Rifles were manufactured by the West Point Arsenal in Cold Spring, New York and also made in 20 and 32-pounder sizes. The 10-pounder Parrotts used during the Gettysburg Campaign had an effective range of over 2,000 yards. The 5th New York Battery was composed of six 20-pounder Parrotts. Confederate copies of the Parrott Rifle were produced by the Noble Brothers Foundry and the Macon Arsenal in Georgia. Parrott Rifles in 10 and 20-pounder sizes were sprinkled throughout some Southern batteries. 3-inch Wrought Iron Gun. This sleek weapon was also called the 3-inch Ordnance Rifle and was designed by John Griffen, superintendent of the Safe Harbor Iron Works in Pennsylvania. The initial design was built by the Phoenix Iron Company of Phoenixville, Pennsylvania which manufactured most of the 3-inch Rifles used in the Union Armies. This iron gun was similar in length to the Parrott Rifle, fired an elongated shell, and was deadly accurate up to a mile. Much lighter than the Napoleon, the gun weighed an average of 800 pounds and could be easily transported and manhandled by its crew. Only a limited number of copies of the Ordnance Rifle were produced at Confederate arsenals. Model 1841 12-pounder Howitzers. A pre-war bronze gun dating back to the 1840's, a number of howitzers were still in use by the Army of Northern Virginia during the Gettysburg Campaign. The barrels of these guns are several inches shorter than other artillery pieces giving them a stubby appearance. These powerful guns packed a whallop at close range but were not desirable for long range work. Larger 24-pounder field howitzers were also produced and though some appeared at Gettysburg, their use was mostly limited to forts and stationary defenses by this time of the war. 3.8-inch James Rifle. The James Rifle was a bronze rifle similar in shape to the 3-inch Ordnance Rifle, and was produced by the Ames Manufacturing Company of Chicopee, Massachusetts. It was not a widely used cannon in either army, though the 2nd Connecticut Battery was armed them at Gettysburg. The James Rifle fired a 14-pound elongated shell and were accurate up to 1,700 yards. 2.75-inch Whitworth Rifle. Imported from England by both North and South, only the Confederacy actively used these unique guns in the field. Designed by Sir Joseph Whitworth before the American Civil War, it fired an elongated 12-pound iron shell which fit snuggly into the fine rifling of the tube. It was also unusual in that it was a breechloader. A locking ring around the breech allowed the end of the gun to be opened so that the shell and powder charge could be loaded through the breech. The gun's unusual shape and distinctive shells were a curiosity when compared to other ordnance, though they were extremely accurate and could fire a solid shot beyond 2,800 yards. Two of the guns were in use by Hurt's Alabama Battery at Gettysburg and the shrill whine of the Whitworth shells was distinguishable above the roar of the cannonade before Pickett's Charge. Though the Whitworth cannon was very accurate, it had a myriad of problems with the breech mechanism. According to Colonel E.P. Alexander, the Whitworth was not as desirable a weapon as the 3-inch Ordnance Rifle. Civil War cannon were mounted on carriages made of oak with iron fittings. There were several different sizes of carriages to accommodate each type of cannon. Carriages at the park today are made of cast iron and are made to replicate the look of the old carriages. These were made in a Gettysburg foundry by Calvin Hamilton, a Civil War veteran, between 1895 and 1910. There were many types and styles of artillery rounds manufactured during the Civil War. Smoothbore guns such as 12-pounder Napoleons and howitzers fired round cannon balls. Elongated or conical-shaped shells were used in rifled cannon. The four basic types of artillery round included SOLID SHOT for use against large infantry formations or opposing artillery, and SHELL which was a hollow iron shell filled with black powder and ignited by a length of paper fuze or a percussion fuze. CASE was similar to a shell- hollow inside and filled with black powder with the addition of iron balls. The fourth type of artillery round was CANISTER, a tin can filled with iron balls and used against infantry and cavalry formations at close range. When fired, canister turned the cannon into a large shotgun. An artillery shell was affixed to a wooden base and a cloth bag filled with one to two pounds of black powder. The shell was placed into the muzzle of the cannon and rammed into the breech. The bag was pierced with a sharp wire through the vent at the breech and ignited by a friction primer- a copper tube filled with ignition powder & fulminate of mercury. The primer was attached to a lanyard that when pulled, drew a serrated wire through the primer igniting the charge. An efficient gun crew could load and fire up to three rounds per minute. This deadly efficiency was never more evident than on July 3rd during Pickett's Charge. A variety of ammunition was used against the Confederate infantry formations. One solid shot plowed into Company I, 53rd Virginia Infantry knocking out 12 men. As the Confederates swarmed up to the Union positions, Union gunners desperately loaded and fired double charges of canister into the gray ranks with devastating results. It is no wonder that infantrymen had such high respect, and loathing, for the big guns. A battery was an intricate organization of men, horses, and ordnance. There were multiple duties for each man to perform when not in battle including care of the horses, gun and carriage maintenance, and routine stock duties. In battle, each man had a specific assignment to serve the gun, though many were cross-trained and could perform other duties when required. One battery in the Union army consisted of six cannon, all of similar type and caliber and each with its own limber and caisson. Teams of six horses were used to pull the limbers and caissons that held ammunition chests containing the different types of shells used in each gun. The gunners walked during the march or trotted alongside the limbers when moving into a position. Only when the situation called for fast movement did they ride on the limbers and caissons when going into battle. Once in position, the gunners would unlimber the cannon and the limber would move to a position directly behind the gun. The caisson team would move to a location behind the limber to await further orders. Confederate batteries were smaller, composed of only four guns and often of different types and calibers. For example, Captain Charles Fry's Virginia Battery, the "Orange Artillery", had two 3-inch Ordnance Rifles and two 10-pounder Parrott Rifles. Captain Hugh Ross' Georgia Battery had one Napoleon, three Parrott Rifles, and one Naval Parrott Rifle. Due to a scarcity of horse reserves in the South, Confederate batteries were forced to limit their horse teams to only four animals. Mules were used when horses were unavailable, but they were not considered a satisfactory substitute as they were more difficult to control. In the Army of the Potomac, the artillery was organized by brigades. One brigade was commanded by a major, lt. colonel or colonel though several were commanded by captains, and was composed of four to five batteries. Every corps had one artillery brigade assigned to it for the use of the corps commander. The artillery brigade commander was responsible for posting his batteries and making certain that each was properly serviced and supplied. Two brigades of horse artillery were assigned to the Army of the Potomac's Cavalry Corps. The army also had a well organized Artillery Reserve composed of five brigades. These reserve brigades supplied extra batteries to support the batteries assigned to the infantry corps, and added an extra amount of firepower when and where it was needed. The Army of Northern Virginia organized its artillery into battalions, each commanded by a major or colonel. One battalion was composed of four batteries and one battalion was assigned to an infantry division. For example, Major William T. Poague's Battalion, assigned to Pender's Division of Hills Corps, was composed of the Albemarle (Virginia) Battery, the Charlotte (North Carolina) Artillery, the Madison (Mississippi) Light Artillery, and Brooke's Virginia Battery. In addition, each of the three army corps had an artillery reserve of two battalions. Despite the larger number of artillery organizations in Army of Northern Virginia, the Union held the advantage in the actual number of guns present during the battle. Many of the Confederate batteries were understrength and missing their total compliment of cannon. Heavy artillery was divided into two classes -- siege and garrison, and seacoast. The siege and garrison pieces could be moved on carriages by road, while the seacoast artillery was much heavier and had to be moved on special carriages. There were times where siege guns were brought into action and used on the battlefield, such as Shiloh and Malvern Hill. As in heavy artillery, mortars were classed as "siege" or "seacoast" guns. The 8-inch and light model 10-inch mortar siege guns, while cumbersome, could be transported on mortar wagons. The longer and heavier models of the 10-inch and the giant 13-inch mortars were classified as "seacoast," as they could only be moved with great difficulty by rail or ship. Mortars typically used spherical shells, and both timed and percussion fuses. Although experiments were made using canister shot as shells, the gun crews were unable to remain at their guns under the shower of metal. See also Civil War Artillery and Cannon: Field, Garrison and Siege, and Seacoast. Although there was great technological advances made during the Civil War, such as the improved casting method by Major Rodman, real progress would be witnessed later with the introduction of nitroglycerin-based propellants. Still, the artillery proved pivotal and deadly in almost every major engagement during the war. From the massed Union batteries at Stones River and Malvern Hill, to the work of a few guns during Hood's 1864 Campaign, the cannoneers bravely and laboriously performed their duty. While battlefield technology advanced, tactics didn't, because American army officers in 1861 had been schooled in obsolete Napoleonic Tactics, especially since many of them had served in the Mexican War, which was still fought in the old way with smoothbore muskets and linear formations. As such, officers typically failed to realize the power of rifles and continued to launch massed attacks against fortified enemies, which invariably resulted in heavy losses. Prior to and during the Civil War, both sides continued to acquire, capture, manufacture, and even modify their respective firearms, small arms, guns, rifles, pistols, and weapons. As the conflict progressed, squirrel rifles had been modified, shotguns had their barrels sawed off, and smoothbore muskets rapidly became obsolete. During the war, the rifle was the most common weapon found on the battlefield, and the majority of the rifles during that time were loaded with a small lead musket ball or with a Minie ball (or Minié ball) and black powder. Most rifles of this era were muzzle loaded rifled muskets. These rifles were used by both the Union and Confederate armies. See also An Introduction to Civil War Cannon and Civil War firearms and small arms. Try our internal search engine, type, for examples: Artillery, Artillerist, Artillery Engagement, Artillery Duel, Artillery Experience, Artillery Exchange, Artillery Battle, Gettysburg Artillery, Cannon Purpose, Cannoneer, Canister, Grapeshot, etc. Recommended Reading: Cannons: An Introduction to Civil War Artillery. Description: The concise guide to the weapons, ammunition and equipment of Civil War artillery; includes more than 150 photos and drawings. While this might look like a simple kids book/pamphlet on the cover, there is far more inside this extremely well illustrated guide. The author does a fine job providing a wide overview of the most important cannons of the American Civil War, textual summaries of each and sufficient details of their fundamental statistics. The amazing part is how much the author has fit between a mere 72 pages. This work is very inexpensive and should prove useful to anyone touring Civil War battlefields, interested in Civil War gaming, reenacting, or curious about civil war cannons. The work meticulously examines the forming of the respective artillery arms of the two armies; the organization; artillery technology; guns; equipment and animals constituting that arm; ammunition; artillery operations; the artillerymen and, finally, actions of the guns on July 2 and 3....The work is perfect for someone seeking more data than found in most general histories of the battle...Nicely illustrated to supplement the text, the succinctly written technical details of ballistics, projectile composition and impact of technology for battlefield lethality will prove similarly useful and exciting for anyone captivated by the guns of Gettysburg. Cole explains the benefits and liabilities of each piece of artillery....His use of photographs, diagrams, and maps are excellent and integrate seamlessly into the text....Not only does it explain why events unfolded the way they did , it helps explain how they unfolded. No other modern book on Civil War artillery of this size is as detailed...as this book is generally...The author's broad approach to the whole subject of artillery tactics shine when he compares and contrasts several artillery incidents at Gettysburg that better explain what was going on at the time....This book is essential for all those interested in Civil War artillery, 19th century artillery, or just the battle of Gettysburg. I found Civil War Artillery at Gettysburg to be an informative and well written account of the 'long-arm' at Gettysburg. The book is very well-illustrated with maps and photos throughout. I thoroughly enjoyed this book and highly recommend it. The general form of each entry is a brief introduction of a page or several pages about the type (Archer, Hotchkiss, Dyer, etc.) and then the following pages contain one to three images of each size and type of projectile of that type. When three images of a given projectile are provided they are viewed straight on from top, bottom, and side. Some images of shell or case are half sections. Entries below each set of photographs provide diameter, length, weight, gun, sabot, fuze, rifling, rarity, provenance, and comments. RATED 5 STARS! Sources: National Archives; National Park Service; Library of Congress; Philip M. Cole, Civil War Artillery at Gettysburg, Da Capo Press, 2002; Dean Thomas, Cannons, An Introduction to Civil War Artillery, Thomas Publications, Gettysburg, 1985; James Hazlett, Edwin Olmstead, & M. Hume Parks, Field Artillery Weapons of the Civil War, University of Delaware Press, Newark, 1983; Monroe Cockrell, editor, Gunner With Stonewall, Reminiscences of William Thomas Poague, McCowat-Mercer Press, Jackson, TN, 1957; George M. Neese, Three Years in the Confederate Horse Artillery, Morningside Bookshop, Dayton, 1988; Norman L. Ritchie, editor, Four Years in the First New York Light Artillery, the papers of David F. Ritchie, Edmonston Publishing, Hamilton, NY, 1997; Jack Coggins, Arms and Equipment of the Civil War, Double Day & Company, New York, 1962; Mark M. Boatner III., "The Civil War Dictionary," David McKay Company, Inc, New York 1959.